Logic Programs with Annotated Disjunctions (LPADs) provide a simple and elegant framework for representing probabilistic knowledge in logic programming. 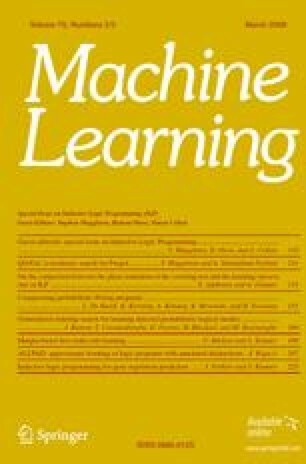 In this paper we consider the problem of learning ground LPADs starting from a set of interpretations annotated with their probability. We present the system ALLPAD for solving this problem. ALLPAD modifies the previous system LLPAD in order to tackle real world learning problems more effectively. This is achieved by looking for an approximate solution rather than a perfect one. A number of experiments have been performed on real and artificial data for evaluating ALLPAD, showing the feasibility of the approach. Editors: Stephen Muggleton, Ramon Otero, Simon Colton. Kersting, K., & Raedt, L. D. (2000). Bayesian logic programs. In The tenth international conference on inductive logic programming, work in progress track. Available from http://SunSITE.Informatik.RWTH-Aachen.DE/Publications/CEUR-WS/Vol-35/. Muggleton, S. H. (2000). Learning stochastic logic programs. Electronic Transactions in Artificial Intelligence, 4 (041). Available from http://www.ida.liu.se/ext/epa/cis/2000/041/tcover.html. Riguzzi, F. (2006). ALLPAD: approximate learning of logic programs with annotated disjunctions (Tech. Rep. No. CS-2006-01). University of Ferrara. Available from http://www.ing.unife.it/aree_ricerca/informazione/cs/technical_reports/CS-2006-01.pdf. Vennekens, J., & Verbaeten, S. (2003). Logic programs with annotated disjunctions (Tech. Rep. No CW386). K.U. Leuven. Available from http://www.cs.kuleuven.ac.be/~joost/techrep.ps.